Tourism is booming in Pulan County. The traditional landscape of yak herders and agriculturalists in the southwest corner of the Tibet Autonomous Region, China, is changing fast. Infrastructure development is keeping pace with increasing demands made by the rising number of visitors to the landscape. Mount Kailash and Lake Mansarovar, considered sacred by different religious groups (Bon, Buddhist, Hindu, and Jain, among others), are major destinations and attract great numbers of national and international pilgrims, as well as tourists. This makes tourism an important source of income for the people of Pulan County. But how to ensure that locals are connected to the fast changing tourism market, and that their incomes are secured in the long run? Targeting an increase in income for locals through responsible tourism promotion, the Kailash Sacred Landscape Conservation and Development Initiative (KSLCDI) has initiated several measures. These range from supporting responsible tourism development, enabling exchanges between international tour companies, and improved sanitation and waste management, to offering specialized trainings for local business owners and associations to improve their services to tourists. As a result, local businesses have been professionalizing and broadening their services: “In terms of sanitation, cleanliness and also service, I have made improvements to my restaurant. It is a good business now,” says Drolma, owner of a restaurant in Korqia that she opened five years ago. She plans on opening another, bigger restaurant in Pulan County town soon. Tsri, another restaurant owner in the area, has increased hygienic standards and included a variety of national dishes in her menu. She says, “I broadened my view and now make noodle dishes, potatoes with rice, Indian dal and fried eggs. I didn’t have these on my menu before.” With the earnings from the restaurant, Tsri supports the education of her three sons. “The restaurant is my most reliable source of income,” she says. Another female restaurant owner from Korqia says, “To further improve the business model, we have put up menus on wall posters to advertise our broader product range.” The three women have successfully taken advantage of touristic development in Pulan County, and earn their main incomes from their restaurants. It is not just restaurants but also other services in the region that are adapting to rising tourist numbers and the employment that comes with it. Renzin, a 58 year old yak herder in Gangsha, has been part of the yak and horse transportation team for many years. 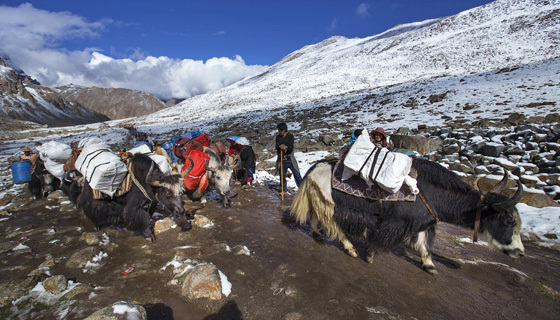 He has been guiding and transporting pilgrims and tourists on their way around Mount Kailash, the so called ‘kora’ for some time now. He and his colleagues have improved their ability to communicate with foreign visitors by working on basic English skills, and better nonverbal communication. 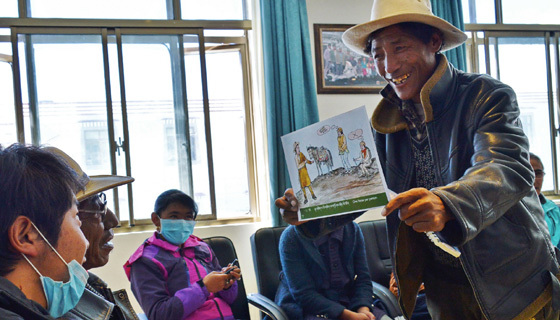 Furthermore, service standards for guiding tourists – through raised awareness on altitude sickness, for example – have been successfully implemented. “All households in Gangsha village live off this business, which is very good right now,” he reports. Additionally, local involvement in the tourism sector also ensures that traditions and customs, like local food and dresses, for example, are kept alive. Investment in the future – making sure resources are made available to upcoming generations, and that ongoing touristic developments in Pulan County flourish – will help secure and improve local livelihoods long term.